Our programs utilize a progressive and ever-evolving curriculum. Our community-based model lends itself to a high-degree of individualization of service provision, to partnering with other treatment providers and teams, and requires a highly personalized and responsive approach to working with mental health, addiction, and behavioral issues. 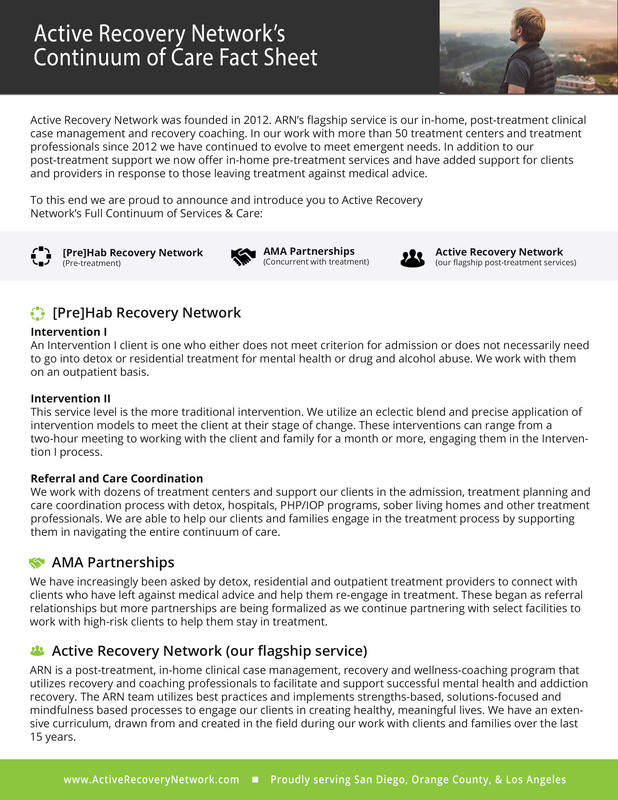 The majority of Active Recovery Network’s clients come to us after leaving a primary treatment setting. Whether have had a recent hospitalization, participated in a residential treatment program, intensive outpatient program, wilderness therapy program or a therapeutic boarding school, our work is largely about supporting them to utilize the skills they have learned and to act on the insights from their time in their respective program to clarify and move in the direction the client wants to go. Our team works to create a seamless continuum of care so that our clients can hit the ground running with creating the new life that they have been preparing to live. The majority of our clients are working to overcome alcohol and substance abuse and dependence disorders. Many of these clients are also managing and a mental health diagnosis. We work hand-in-hand with our clients’ psychiatrists to support medication management, healthy lifestyle choices, increased community integration and the life skills that support and foster independent living. We also do great work with those who have NO substance abuse or dependence history. About 1/3 of our clients do not have any current or past substance abuse history but are working with a diagnosis of bi-polar, depression, anxiety, PTSD, or a spectrum disorder. Our work with these clients is similar in many ways but is also different in a few key areas. One of these areas being an increased focus on integration with long term, affordable community resources to ensure long-term success and independence. We also team up with local intensive outpatient treatment programs to provide in-home support while they continue to participate in their IOP. We find great success in providing this kind of support and can support our clients in getting to their IOP program, engage them at the level of motivation, and help them apply in vivo the skills they are learning. We also work with clients who have never been to treatment or who have not been to treatment in five years or more. We refer to these clients as “pre-treatment” and these clients and families are looking for a more preventative type of support and are hoping to mitigate substance abuse, support medication management, increase intrinsic motivation, connect socially, learn life and independent living skills, support in exploring values, meaning and purpose and more. These often include primary mental health clients who have somewhat successful managed their diagnosis but need support in moving their lives forward. Paul is a 42-year-old business owner who is married and has children. He was a college athlete who partied on and off through his teens, into college and then as he was growing his business and into his married relationship. He has no reported mental health diagnosis but can tend to be anxious and a little bit perfectionistic. Active Recovery Network got a call has he was exiting detox against medical advice for the third time, for methamphetamine and alcohol abuse. They thought it would be helpful for us to work with him in his home as well as with his wife. After working together for a few months, Paul relapsed on alcohol. He and his wife agreed that it would be helpful for him to live in a sober living for a month or two and for them to attend couple’s counseling with a Gottman Certified therapist weekly. This was a very helpful combination!! As he stepped out of sober living we worked with both of them to develop their needs and feelings literacy, get to know their personality profiles (and see what those look like in intimate partnership as well as how they are as parents), to learn their “love languages”, and to work together to discover and set individual and personal goals and become both support and accountability partners for re-building their relationship and restoring the foundation to their parenting relationship. Marc is 15. His parents are married and he has a brother who is 4 years older who is taking a break after his freshman year of college. Marc was a sociable youth and did well in school. He is introverted and usually held back a bit socially. In 8th grade it was reported he began withdrawing socially and reported being depressed. He also started experimenting with alcohol, marijuana and hallucinogens. Marc started seeing a psychologist and psychiatrist shortly thereafter and he switched schools. He went to a therapeutic boarding school for a year because his depression and anxiety didn’t seem to be lifting and he was struggling in school. He did well there, is now at home but has recently plateaued. His psychiatrist recommended working with Active Recovery Network. Active Recovery Network recommended he get involved with an adolescent IOP locally and then they can work with him at home in conjunction with the IOP. They will also be doing family work with his and will ramp up their meetings with Marc as he steps out of IOP to make sure he is supported, has a plan and accountability, can help him get his first job and feel more confident and competent engaging socially. Aimee is a 24-year-old college student who came to us in pretty rough shape. When we met a few years back she was homeless, using methamphetamines and was experiencing some psychotic features (mostly auditory hallucinations). Her psychiatrist called Active Recovery Network to see if we could connect with her, help her gain some stability through finding her housing and working to help her reduce or stop using drugs of all kinds, while working to build a supportive therapeutic and coaching relationship. Through our year plus of working together we were able get her into a primary mental health treatment facility, help her step down into sober living and an outpatient program, get her enrolled in school, help her find a part time job and then help her move into an apartment with a roommate. All the while we worked with her once or twice weekly to help her with medication management, hard and soft life skills, work on short and long term goals and help guide her in building healthy adult relationships. The psychotic features were from the drugs and anxiety. She’s now doing well and in school and working full time. She is still working with a psychologist and psychiatrist and building a better relationship with her family. Jordan, 25, was in a primary mental health treatment facility for 3 years. He has been clean and sober for 4 years and has a diagnosis of Obsessive Compulsive Disorder as well as a Schizophrenic diagnosis. When he was using drugs and alcohol he was in and out of hospitals and locked treatment facilities for 6 years, starting when he was 17. His mom reached out to us via his psychiatrist for in home coaching, medication management and life skills support. We’ve been meeting with for over a year and he is working, thinking about school, eating better and exercising. He is on a monthly injectable medication and has a few good friends he has over to watch sporting events on occasions. He is getting into cooking and has started to play the guitar again.